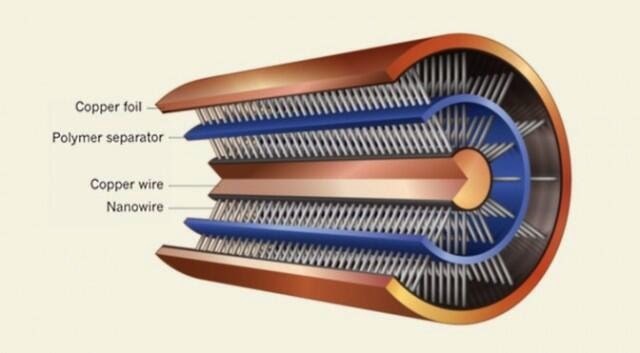 Researchers at Florida University have turned copper wires into batteries for much simpler power storage. The breakthrough could mean smaller consumer electronics, or could be embedded in to hybrid and electric cars or even clothing to help recharge gadgets like phones. Nanotechnology scientist Jayan Thomas was reported in the media as saying "he believes he has discovered a way to store energy in a thin sheath around an ordinary lightweight copper electrical wire so that wires sending energy can also store it. "We can just convert those wires into batteries so there is no need of a separate battery," Thomas told Reuters. "It has applications everywhere." The discovery has created a lot excitement in both the mainstream and scientific media. It's both the cover story in the latest Advanced Materials Journal and an article in the current edition of science magazine Nature. One of the co-authors of the study, Thomas's Ph.D. student Zenan Yu, told Reuters the process is relatively simple. "First", he said, "he heated the copper wire to create what he described as fuzzy "nano-whiskers," which are naturally insulated by copper oxide, vastly expanding the wire's surface area that can store energy." "A second plastic-covered layer of nano-whiskers creates a second electrode, similar to the positive and negative sides of a standard battery," Thomas told Reuters. "The technique could be used to lighten airplanes and spacecraft, to store excess energy from solar panels, and to further miniaturize small electronics," he said. "The technique could also replace high energy-density supercapacitors, sometimes mistaken by hybrid car owners as a second battery, which provide the quick shot of energy that cars and heavy machinery need to start." "You open your trunk and you see a lot of space is taken by your batteries. If you can just use some of the cables along the length of your car, you don't need any of that space for batteries," Thomas said. He plans further research to apply the same technique to fibers woven into clothing along with a flexible solar cell, creating a wearable battery pack.